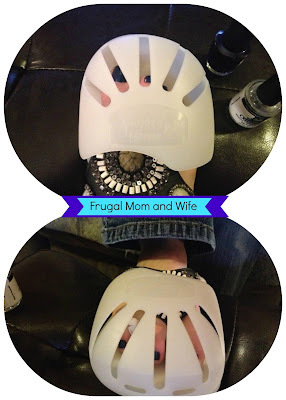 Frugal Mom and Wife: Pedi-Protexx Review by Frugal Mom and Wife! Pedi-Protexx Review by Frugal Mom and Wife! Finally a solution to my number one problem when it comes to pedicures...Pedi Protexx!! because it protects your toes until your pedicure is dried. myself, so I get especially discouraged. to prevent damage to wet polish even if you bump into something. Not only are they comfortable, they are also easy to put on. they grab on to the thong of your flip flop. One size fits most all feet. Best of all you can actually walk and drive with Pedi Protexx. That means you don't have to wait even longer at the salon before you head home! I received a pair and I gave myself a pedicure. because I was able to get up and move around without the fear. If you would like to learn more about them, visit Pedi-Protexx online or on Facebook.